Night Goblin Squig Hoppers and Iron Claw Goblin Fanatics | Azazel's Bitz Box. 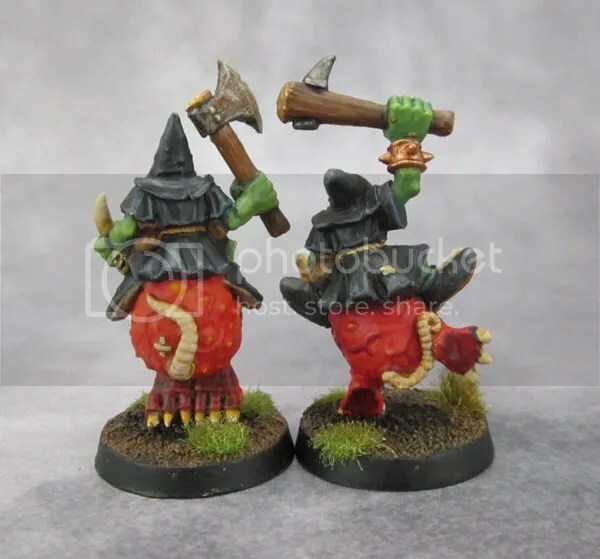 The first two figures in this update are a pair of the first batch of Squig Hoppers released by GW for 4th Edition WHFB, back in 1991-1992. 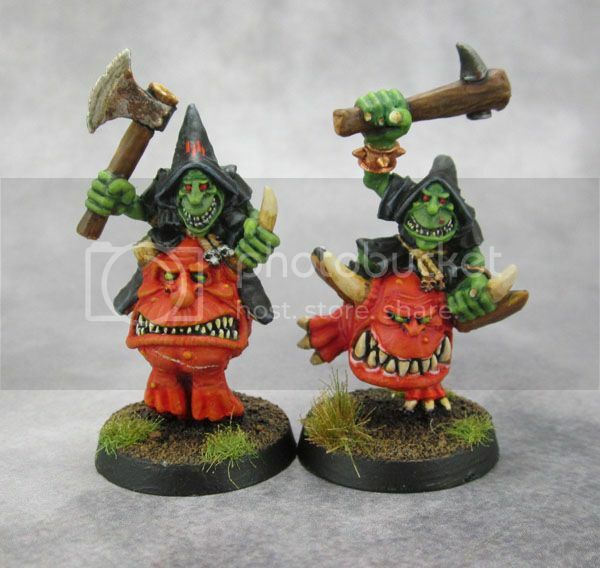 WHFB3 (the “Oldhammer” edition) didn’t feature Squigs in any form, and goblins were really just goblins. When WHFB4 came around with it’s 40k-codex style army books, Goblins gained several subtypes in a properly-supported form, such as Night and Forest. I seem to recall mentions of Night Goblins predating 4th edition, so there’s that. Night Goblins have kind of become the de facto subtype in more recent years as opposed to the more generic ones from WFFB3. Anyway, I really quite liked these models, and so I collected quite a few of them. One of these two was painted quite awhile ago (5 years? 10? Who knows!) while the other was started right afterwards and only finished last year. It was shown last year in near-complete WIP form at one point, but I never showed off the completed model. As I’ve stated elsewhere – sure these Kev Adams sculpts look cartoony, disproportionate, and not especially realistic. But they do have real character. I’m well aware how often “character” is used as a kind of code/excuse for poor sculpting of older models, but here I really do mean it as a positive. 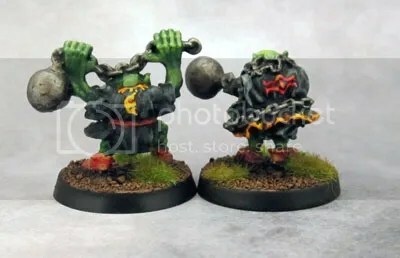 These models might be a year or two out from “Oldhammer”, but being from the Kev Adams run of goblinoids, they’re Oldhammer and Old-school enough for me. More importantly, they’re great models in their own right that still stand up well today. The second pair I’m sharing today were both painted a long, long time ago. Back when I used to actively play WHFB, in fact! 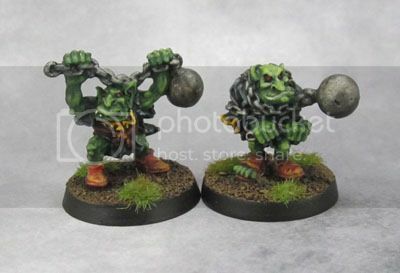 These are Bob Olley sculpts – Goblin Fanatics from his Iron Claw range circa 1998. Since they’re painted in the colour scheme of Night Goblins, they’d have been painted during the early days of 4th Edition. Goblin Fanatics showing off the Night Goblin Moon, and the Red Eye. As regular readers will know, I’m not an especially big fan of many of Bob’s sculpts, and these are no exception. Still, back in the day you pretty much only had what was available – and this was it. No eBay, no internet shopping and mail order to GW from Australia was a rare and exciting occurrence. Especially for a teenager or young adult. You can see that the flame motif used on my more recent Night Goblin Fanatics goes way back, though. Because I am nothing if not imaginative and experimental. With these models being real outliers of the “weird and random” part of the WHFB Orc and Goblin list, they don’t really fit in to a KoW Goblin Army as the list stands right now. Hopefully with the “officially unofficial not-GW army lists” that are supposed to come out later on in the year, these guys will find a home on the tabletop again in 2015. 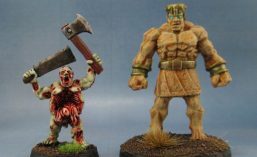 This entry was posted in Age of Sigmar, Fantasy Gaming, Orc and Goblin Army, Warhammer Fantasy - 9th Age and tagged Goblin Fanatic, Iron Claw, Night Goblin, Oldhammer, squig hoppers. Bookmark the permalink. I own a couple of squig hoppers, too. One for sure, that got his weapon removed to live a new life of glory on Blood Bowl pitches (there was a squig hopper Star Player published on a Citadel Journal, if I recall correctly). Nice work! I have all of those figures as well, the Squig Hoppers were painted a long time ago during 4th Edition I think. The Olley sculpts I picked up for my new old school army, I do like his goblinoid faces. Thanks! The Iron Claw ones are certainly old school, but don’t do it for me. I remember had had a whole line of Giant Black Orcs as well. If you want some non-GW Olley Ogres (but still very nice, and from the 1990’s, RPE has quite a decent range. Some nice figures there in the Ral Partha range, but if I’m ever doing ogres, I’ll have to start with the Citadel ones, for nostalgic reasons. Pingback: Oldhammer Goblin Unit & Boss (for KoW) | Azazel's Bitz Box.